Home Documentation What is Convertize? Convertize is an A/B Testing Tool combined with a Nudge Marketing app. It then gives you a user-friendly interface to implement A/B Test Experiments (without any need for coding). You can also add Nudge Marketing Notifications to convert more visitors into buyers. What can you do using Convertize? The Convertize platform offers drag-and-drop SmartPlugins such as Dynamic Text and Geolocation, enabling you to create a much more personalised user experience. Furthermore, our recently added Persuasive Notifications Workspace lets users quickly and easily set up notifications on any page of their website. 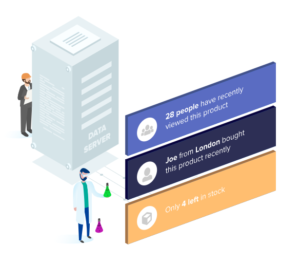 Our notifications templates are designed using consumer psychology, and leverage principles of Scarcity, Urgency, and Social Proof to increase conversions. You can also set up custom notifications that use real-time website information to enhance user experience. We built this optimisation platform because we felt that existing optimisation software, while useful tools, don’t give guidance on what to optimise. They provide you with the tools but not the expertise. 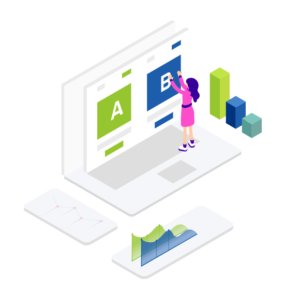 We have integrated our in-depth knowledge of cognitive biases into the software, providing 250 detailed optimisation tactics to structure your testing around. Our AB testing ideas provide simple ways to optimise a range of standard pages. Combining this knowledge base with our AB Testing and Nudge Marketing features, any eCommerce business can easily optimise its landing pages, streamline its checkout pages and increase its conversion rates. Our platform has been designed to help you build a successful conversion rate optimisation strategy. Find out why Megan chose to use Scenario by Convertize in our new video.